This Saturday night the WA Super Sedan Title will be held at the Narrogin Speedway, on a night which promises a highly competitive title, with many drivers having a very serious chance of winning the event. 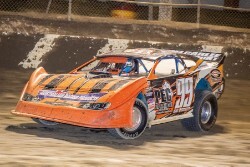 The Super Sedan season has been interrupted with cancelled events and washout, meaning most drivers have had no more than six events to this point of the season. Defending Champion Warren Minshull will put his title on the line on Saturday night, looking to join a select group of drivers to have won the title three or more times, with the two time Champion having only raced once in the South this season at the 50th Anniversary meeting last October. Minshull will have stiff competition from several angles, including Chris Pavlovich who has been one of the prominent drivers in recent years, though Pavlovich is yet to win a State Title. Gary Higgs is in the same boat, and has been the back bone of the category for more than two decades now, having first podiumed in 1995 when he placed third. Since then he has placed third on three further occasions and second four times, with the number one eluding him. Higgs who finished second last year to Minshull will be looking to go one better. Lee Aylett had a very good month, competing against the Nations best drivers, acquitting himself extremely well and is certainly one who could take out the title on Saturday night. Veteran Kevin Bell also has shown good car speed, and finished second at Albany in January and like Higgs would break one of the longest streaks in Australian Speedway, having first podiumed in 1991. Adyme Harvey who won the 50th Anniversary event also can not be discounted, with Tristan Green, Dean Shore and Terry Green also in the field.